By Karimah Bint Dawoud, food writer and ECO warrior. This late summer break fast times are great for getting the BBQ out, so that’s exactly what we did this weekend. 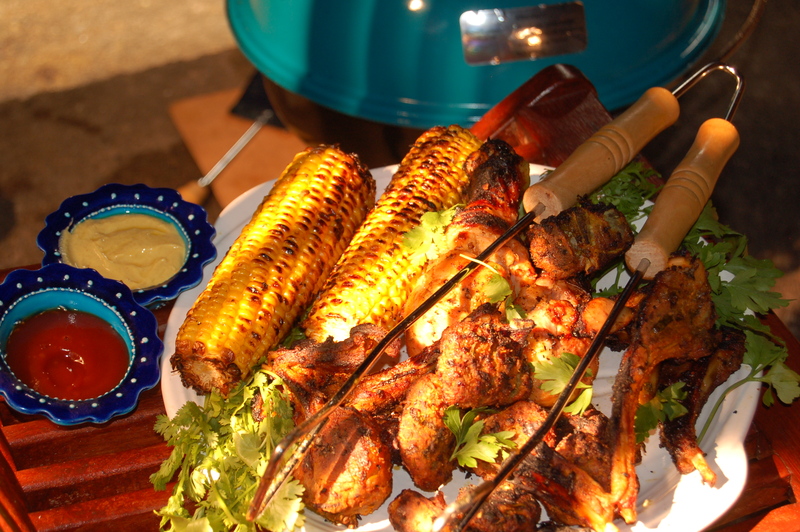 As well as having the traditional corn on the cob, we had chicken flavoured with this marinade and burgers flavoured the Moroccan marinade all in my book. This smokey marinade recipe is taken from my book “Heavenly Bites, the best of Muslim Home Cooking” a great Eid present, especially for young women who want to learn how to cook or its comprehensive array of multicultural recipe, if you fancy learning something from another culture. My earliest memories of BBQ are quite boring long ago in Essex, BBQ was a thing people in America or Australia did and we just heard about it or saw it on Neighbours TV program. Over the years with this wonderful global warming the summers are getting hotter although sometimes that seems like a fantasy when the summers are cool, or looked at another way, Allah blessing us with coolness throughout Ramadhan to make it easy for us.. This recipe is inspired by the chef and food warrior Jamie Oliver; I had to change the recipe a bit so Jamie wouldn’t be knocking on my door, although from Essex like me he would be most welcome as long as I had a maharam. Most of the ingredients can be easily obtained from your local halal supermarket; smokey paprika can be bought from some large supermarkets and also in Portuguese shops, in places like Portobello Road and the Golborne Road in West London where large communities of Portuguese live peacefully side by side with Moroccans mashallah. ½ cup /120ml olive oil. Mix all Ingredients together; cloves, fennel, cinnamon, cumin, bay leaves,thyme,black pepper, salt and smoked paprika, use a mortar and pestle or coffee grinder. Add lemon/orange juice, ketchup/ puree and vinegar and turn the machine on for 1 minute to make sure garlic bulb has broken down and blended. Pour in an air tight bottle and store in the fridge until needed, will keep a couple weeks in the fridge. To use, pour over cleaned meat and toss so that all meat is covered with mixture, place in plastic container and cover with lid or wrap well with clean film making sure no mixture is outside the container, when you work clean there is less risk of nay infection from uncooked meat juices. Leave to marinate for at least 3 hours in fridge, then roast grill or BBQ.